Angel Hall is an accountant by trade but was inspired to volunteer after seeing how her skills could help families in need. 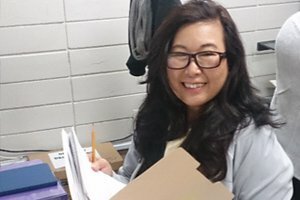 Now a registered Volunteer Income Tax Assistant through United Way, Angel is proud to play a part in a cause that gives back to her community. Discover her story below. After my divorce in 2011, I lost my job at the bank not long after. I decided to put an end to the negative energies by returning back to college and completed a Business Administration course and received an Associate Arts Degree. After I completed all General Accounting courses including Accounting Taxes, my professor suggested that I volunteer as a tax preparer to build actual skills. I started my VITA Tax Preparer training and was assigned to my first volunteer role at Congresswoman Judy Chu’s Pasadena Office. My first volunteer role was to provide free tax preparation to low-income families. I believe this is a great way to give back to the community. There is nothing like seeing the joy on someone's face after I’m able to help them. One of the taxpayers shared her appreciation by writing an article about me in the China Daily newspaper. The tax payer explained how I helped her with her tax return and how the program helped other low-income families within the community. This was a positive energy booster. Furthermore, it felt like an award for my personal achievement that I had not felt for a long time. Why are you passionate about United Way’s mission? I am passionate about United Way's mission because I learned about all the amazing agencies and nonprofits in the United Way network that offer many services to children, individuals, and families in the Los Angeles community. I am able to donate a relatively small amount of my time each week by volunteering for the VITA Tax Preparer program. It’s helpful to a great number of people and I am glad to be a small part of it. I would say it’s King’s Fish in Calabasas. They have variety of seasonal fresh oysters. And The Angeles National Forest because I love mountain drives. If you had a “Social Justice Magic Wand,” what is the first thing you would do with it? If were a powerful Merlin, I would make age discrimination vanish. Age discrimination is affecting the unemployment rate for those over 40. Because of ageism, job applicants over 40 are struggling to re-enter the workforce. They are too young to retire and too old to rehire. But they need additional income in order to continue building their retirement funds and avoid being homeless. Look in your crystal ball 10 years into the future, what are the three things you'd see?